U.K. Prime Minister says Muslim women immigrants could be deported if don’t learn English. 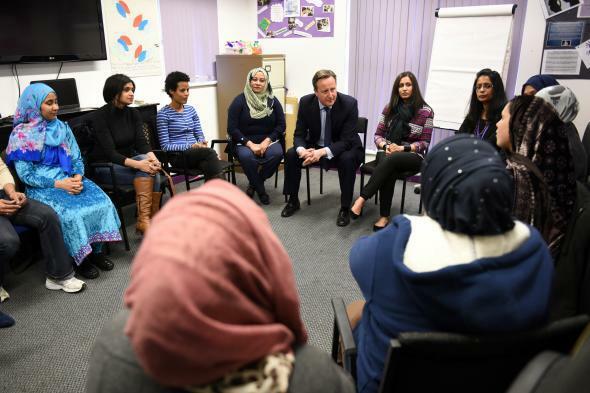 Prime Minister David Cameron (C), speaks with women attending an English language class on January 18, 2016 in Leeds, England. British Prime Minister David Cameron on Monday announced a plan to boost the English language fluency of Muslim women immigrants residing in the U.K. The thinking behind the $28.5 million plan is to offer language classes to help combat social isolation and increase integration for the 190,000 Muslim women living in England that, Cameron says, are able to speak little or no English. We must also make more progress on English language… This has to be tackled head on. We’ve already introduced a language test for new migrants, but I believe it’s time to be much more demanding. Yes, we have responsibilities to migrants, but they have responsibilities too. At the moment, someone can move here with very basic English and there’s no requirement to improve it over time. We will change that. We will now say: if you don’t improve your fluency, that could affect your ability to stay in the UK. This will help make it clear to those men who stop their partners from integrating that there are consequences. “Britain already requires prospective spouses to demonstrate English language skills to roughly that of a child starting primary school,” the Associated Press notes. “Under Cameron’s plan, spouses would have to improve that ability to a higher standard after five years—or face deportation.” The plan received immediate criticism for linking the inability to speak English to extremism; Cameron said there was no causal connection between the two in subsequent interviews.